Digital photo camera Euromex CMEX DC.5000-C. 5 MPx and USB format. 2592 x 1944 pixels. 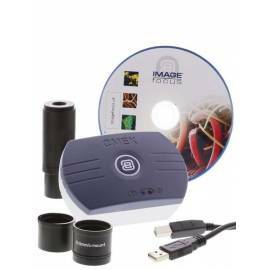 Includes software Image Focus v4 and cable for connection to a PC. In addition to the capture of images and videos, the software allows for measurements in still images and in vivo and annotating the captured images. Compatible with Windows XP, Vista, 7, 8, and 10, in configurations of 32 and 64-bit. Exposure Automatic or manual, from 1 ms. up to 800 ms. 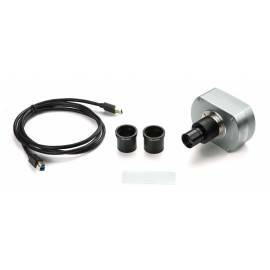 Supplied Lens 0.45 x with C-mount, USB 2.0 cable, adapters to 30 and 30.5 mm for stereo microscopes, pattern calibration 76 x 24 mm with a scale of 1mm. in 100 parts, CD ROM with program ImageFocus V4, cardboard box. Compatible with Windows XP, Vista, Windows7, Windows 8, Windows 10 (configurations of 32 and 64 bit). OSX (only for capture of images and videos).